Now that our RRR months are back again we are ready to feature some amazing locally grown shellfish at all of R Salty’s locations. It is true that shellfish is at its peak in months that have R in them and especially when the weather gets colder. One of the best things in the Pacific Northwest is our ability to grow amazing oysters, clams and mussels. The waterways throughout the Puget Sound and bays along the Oregon and Washington coasts are ideal for these little mollusks! This month I am giving you one of my favorite ways to cook steamer clams. Just the words steamer clams conjures up memories of my family sitting around a pot fighting over these tasting morsels then dunking them in drawn butter. The salty and rich flavor of clams is a true Northwest treasure that needs to be savored with every slurp. 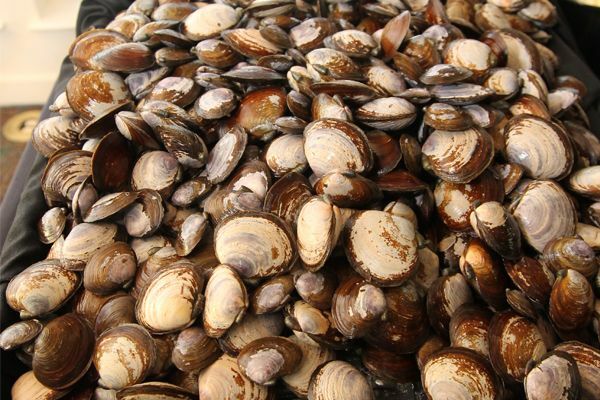 Make sure your clams are nice and clean before boiling. If these are fresh dug clams then put 1 cup cornmeal in a shallow pan, add cold water, and salt. Then soak the clams for 2 hours. The clams will spit out the sand and replace with cornmeal. Make sure if there are any clams that are dead do not place in the pot. Also if any clams seem REALLY heave that means they are probably full of sand. Place the clams in the bottom of a huge pot. Add the onion, carrot, celery, fennel, garlic and beer or wine. Here is where you can add your sausage or sundried tomatoes. Place over a burner on high and cook until all clams are open and beautiful!! Pull the clam pot off the burner. Toss in butter and parsley and enjoy! !